Diet in the wild: The pirarucu eats certain species of catfish. It is known to leap out of the water and grab small birds from the overhanging trees. 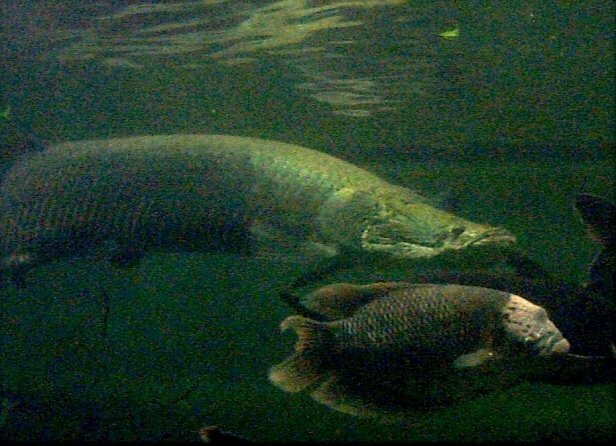 Physical description: The pirarucu is one of the largest freshwater fish in the world. It can grow up to 10 ft long and weighs around 400 lb. This size is small compared to the documented size about 100 years ago which was 15 ft (4.6 m). This fish has a flat bony head, followed by an elongated body which is scaly. Its tail is short and stumpy. The color of this fish is begins with a copperish green at the head then to a darker blue-green which fades at the white belly. The fins at the edge of the tail are a reddish color. 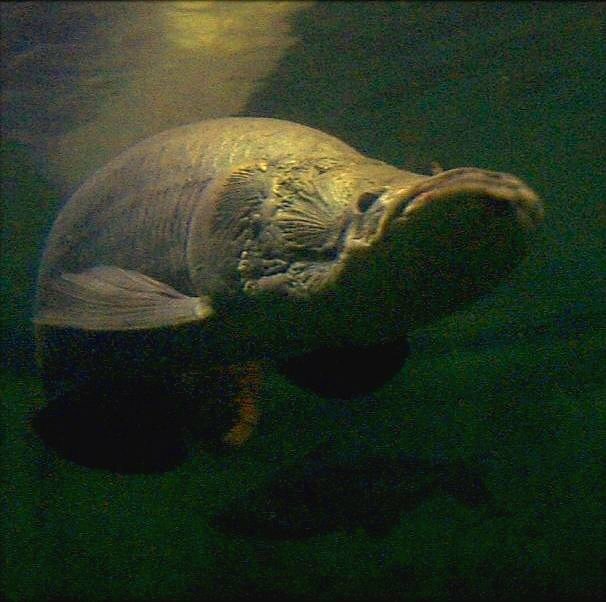 General information: The Pirarucu is one of the largest freshwater fish in the world. It is known as the giant of the aquarium. The use of pesticides has threatened the pirarucu and the animals dependant on the aquatic environment in recent years. The pressure of human population has lead to overfishing and has depleted this fish that was once very abundant. The pirarucu catch has halved since the 1970's and today accounts for just five percent of total production. Native people use the dry scales of the fish as sand paper, the tongue as a grater and the meat serves a delicious dish locally known as Arapaima. The Amazon Indians tried to catch this huge fish and found it difficult because of the lack of metal-tipped harpoons. Once the fish was caught it had to be salted immediately since it deteriorates very rapidly. For these reasons this fish was not a favorite among the Indians. The Europeans on the other hand liked it for its size and cod-like flavor. I would like to add that this fish spawns (production of offspring in large amounts characteristic of aquatic animals) from January to March, laying thousands of eggs in a pit dug well into a sandy substrate. One of the parents (which one is not known) develops white tubercules that nourish the fry. Special anatomical, physiological or behavioral adaptations: This huge fish has a bony tonque (hence its belonging to the Osteoglossidae) that has a second set of teeth embedded into it. This allows it to chew up catfish that are protected by armoured plates. The Pirarucu interestingly enough enjoys waters that have a low oxygen content. This allows the pirarucu to catch more fish to eat. The low oxygen concentration of the water makes other fish more sluggish and easy prey . Like other large fish living in warm water, it is an air-breather, using its swim bladder, which is rich in blood vessels and opens into the fish's mouth. When the fish feeds, it can open its mouth very suddenly, so that it creates an underwater vacuum into which the water -- and any prey within it -- rushes with a loud pop! Comments about the Pirarucu at the Fort Worth Zoo. This monster requires an extremely large tank with well filtered, highly oxygenated water since he does not come up for air as he would in the wild. A temperature of 74-78 degrees F and a pH that is slightly acidic is suitable for this fish in captivity. Personal Observations: Because of its large size, the giant Arapiama is obviously best suited in a large public aquarium. The fish spends most of its time cruising around the aquarium with winding body motions.